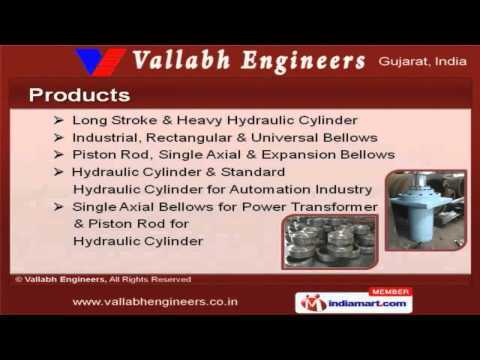 Welcome to Vallabh Engineers, Manufacturer and Supplier of Bellows, Hydraulic Cylinders and Pipe Fittings. The company was established in 2005 at Vadodara. Experienced engineers and technocrats make us unique in the industry. International quality standard, Client centric organization and Competitive prices are the reasons behind our success. We offer a wide assortment of Industrial, Rectangular and Universal Bellows. Our Long Stroke and Heavy Hydraulic Cylinder are best in the industry amongst others. We offer Industrial, Rectangular and Universal Bellows that are in huge demand across the global markets. Piston Rod, Single Axial and Expansion Bellows offered by us are some of our best selling products. Our Hydraulic Cylinder and Standard Hydraulic Cylinder for Automation Industry are a class apart. We offer Single Axial Bellows for Power Transformer and Piston Rod for Hydraulic Cylinder that are extremely reliable.